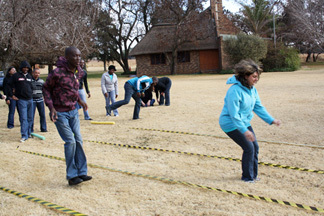 Crazy Games is a combination of six to eight different games that can vary depending on the venue and circumstances. Games includes Marble Run, Helium stick, Horse Derby, Balloon Popping, Creative Building, Untie Me, Frisbee Golf, Drunken soccer, Gumboot Race, Hoola-Chain, Noodle Race, Chicken Run, Beer Nappy, etc. Teams will compete to score maximum crazy points. This event includes a PA system and music.